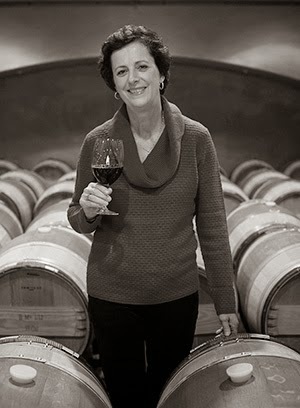 Genevieve Jansen has been the head winemaker at Robert Mondavi for 35 years. Of the '87 cab, she says, "Tim [Mondavi] was trying so hard to make a Bordeaux. When we first tried this wine, it was very tight." The last time she tried the wine was on Robert Mondavi's 100th birthday last year. Her thoughts on the cuvee: "Beautifully soft tannins with Brazil nut, blueberry and green cocao notes. The cedar box smell was so inviting, and I had a memory of my father's smoking jacket." Now is your once-in-a-lifetime opportunity to try a veritable piece of Napa Valley history in the peak of maturity. The 1987 Robert Mondavi Cabernet will be featured at the High Steaks wine dinner on Thursday, April 24th. 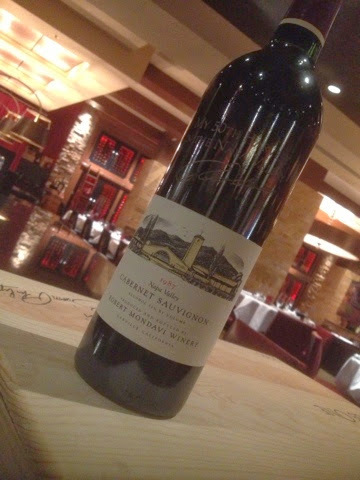 We will also be pouring the 2007 Robert Mondavi Reserve Cabernet, so you can see, smell and taste the difference that a couple of decades makes. We also have a handful of bottles that will be offered on our wine list, so come to High Steaks and try this legendary wine! 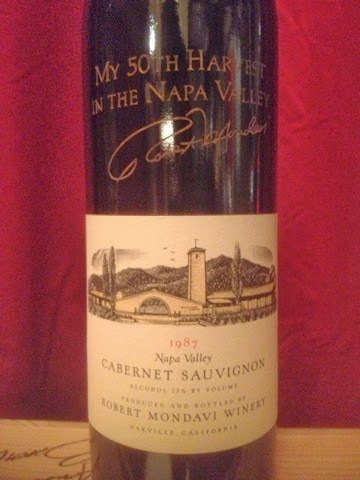 A close-up of the label, with etched and hand-painted signature of Robert Mondavi.